I love birds birds. For Christmas last year my parents got me a bird book. I am trying to talk my mom to get stuff to make a bird watching area. Then for Easter my mom got me a new sketch book. So I have decided to draw birds and Flower in my new sketch book. Then about a month ago my mom got me a new bird book that has the birds broken down by months. Which is helpful to me because it has birds that are in my back yard and has cool pictures. So in my picture I decided to draw a blue bird but I did not just want a bird on a big sheet of paper so I added a birdhouse. 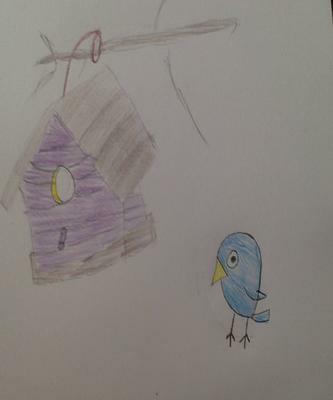 Which drawing a bird house was my first time.